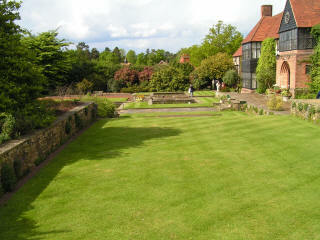 One of the gardens of the Royal Horticultural Society (RHS). It is 240 acres of garden with richly planted borders, rose gardens and model gardens. 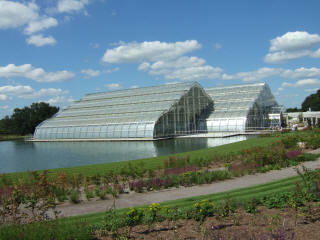 It has trial fields of flowers and vegetables and used for testing composting etc. as well as a Pinetum and half-timbered Tudor-style buildings. The soil is mainly acid sand which is poor in nutrients and fast draining. There is a canal designed by Sir Geoffrey Jellicoe, a rock garden, formal and walled gardens, mixed borders, a rose garden, rock garden, alpine gardens, glasshouses, a fruit field and model vegetable gardens as well as an arboretum. All year except Christmas Day. Open Bank Holidays at 9am. 1 carer admitted free per wheelchair user, visually impaired or other person whose disability requires a carer. Special Needs Access: All buildings accessible to wheelchairs. Recommended wheelchair route through the gardens, available from gatehouse. Special Needs Facilities: Designated car parking spaces 50-300m from garden entrance. Drop off point outside entrance. Manual wheelchairs available. Electric mobility vehicle runs for free around the garden from 10am-4pm daily. Adapted toilets in car park area, in main catering facilities and dotted around site. Please let us know any other information that we can add to the Further information and Planning Grids or page and any errors that you discover. Before making a long trip to any location it is always wise to double check the current information, websites like magazines may be correct at the time the information is written, but things change and it is of course impossible to double check all entries on a regular basis. If you have any good photographs that you feel would improve the illustration of this page then please let us have copies. In referring to this page it is helpful if you quote the Page Ref at the bottom of the Planning Grid above. To print the planning grid select it then right click and print the selected area.